Your Smile. Your Dentist. Your Health. Safe, modern, with extended hours for your convenience! At Great Hill Dental in Braintree we practice “whole health dentistry”. What does that mean? Well, did you know that your overall physical health is now medically proven to directly connect with how healthy your mouth is? Many dangerous diseases – such as heart disease, diabetes, and the danger of a stroke – have a direct, medically proven association with gum disease. Whole Health Dentistry is dental care that considers more than just your mouth – we provide care that considers your whole body health. Our care recognizes the risks associated with these diseases and provides personalized, modern dental treatment tailored to your SPECIFIC body biology, to lessen these risks and provide the best possible health benefits. We are a multi-specialty, multi-site practice. With our team-centered approach, you will be able to get referrals within our talented group of dental care-givers, completing your care with the same staff regardless of what dental services you require. 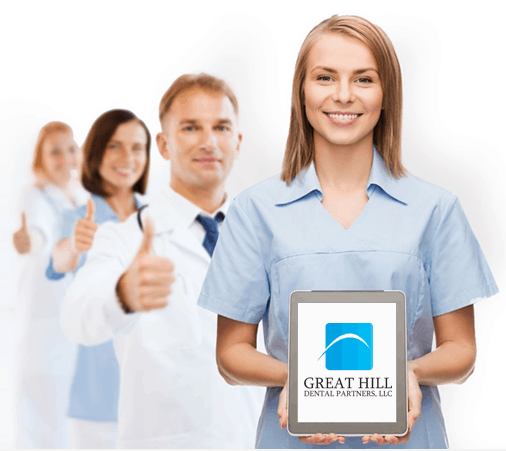 Great Hill Dental offers general dentistry, PPT (Progressive Periodontal Therapy) restorative dental treatment, dental implants, oral surgery*, root canal therapy, periodontics, orthodontics, Invisalign®, pediatric dentistry, Endodontics, prosthodontics, and oral care for patients battling cancer (Dental Oncology). We look forward to caring for all your dental needs. Please call us if you have any questions. Thank you!